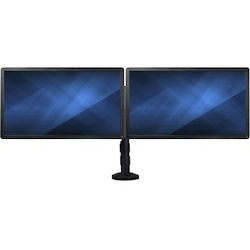 This deskmount dual-monitor arm lets you mount two 13 to 27 inch VESA mount monitors, each weighing up to 17.6 lb. (8 kg), onto a single low-profile base. It gives you flexible desk-clamp or grommet-hole mounting, letting you save space while creating an ergonomic workspace in any office environment.With a stable dual-arm design, the double-monitor mount lets you create more usable work space by mounting your monitors side by side on a single base. The screen mount features a flat low-profile back that lets you position your displays against a wall or cubicle wall.